HOWEVER; I have fit this on an earlier 1970 model fj40 and the bolt holes as well as the windshield knobs match. Several customers have purchased and installed this on older fj40s. The only difference that I have found is the older dashes did not have a dash light. 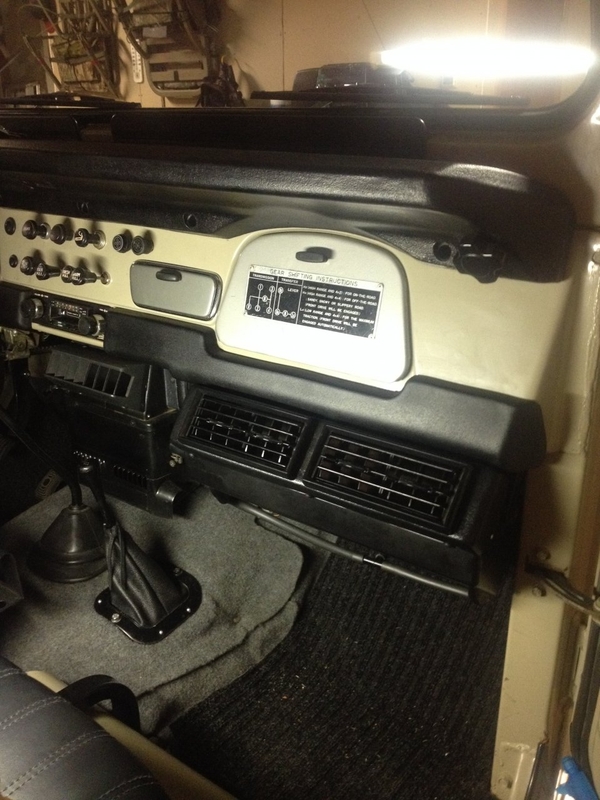 Many customers with earlier model fj40s install the dash and put a later model dash light in, connecting it to their light switch. PLEASE read all of below before shooting an e-mail with a question that is probably answered here. TEXTURE: The texturing is 550 bead blast, it's not the same as OEM's calf grain, looks close, but is not the same. A better close up picture of the texturing can be seen on the lower dash pads (Same texture on both Lower and Uppper Dash Pads). Go to the Lower Dash Pad page and the texture area description will tell you how to pull up a close up picture of the texture. LOGO: There is a logo for the website FJ40DASH.COM on the face of the dash next to the right hand of the steering wheel, It's not big or gawdy if you click on the photo and enlarge it will bring up the logo. I never wanted to put the LOGO in there to begin with. What happened I had the tool made several years ago and just never had the time to get back around to making this product. When we went to texture the tool we found a gas pocket or Porosity in the tool. There really was no good way to get in there to fix it and not be able to see it on the finished product. Therefore we decided to put a small logo there to cover up the porosity. International Shipments: Go to the bottom of the page to see if we can ship to your country via USPS as several countries have a 42" maximum length. If your country is listed or not listed here you might want to take a look on e-bay for our international dash. It might be cheaper to buy through e-bay and take advantage of their international shipping. What happens is we ship to their warehouse, they palletize along with other items going to your country and ship it bulk. It takes longer but I believe it is significantly cheaper. Material: This material we make this out of is extremely tough and durable. See video below. We are professionals do not try this at home!! You might break a windshield. However, I can only make it so tough and resistant boys and girls....You leave it out in the sun, rain, snow, and sleet 24/7 and after several years you will see some wear! I make this statement because I know that down the road I am going to have some knucklehead that has left the product outside 24/7 for four years through all the weather conditions and come back because it doesn't look like it does brand new! Nothing will, unless you take proper care and maintenance. As with any plastic the most damaging variable is usually UV and the weather. That's why every fj40 has a cracked dash. As I stated earlier we use this same chemistry on OEM heavy construction equipment that is out in the weather and have yet to have product returned due to being defective or it was unable to endure the punishment of a construction site. Watch the video. In the video below I reference IHMud it should have been IH8MUD.com The website is fantastic and I apologize for not saying it properly. I've used it as a resource for fixing up fj40's over the years. I purchased the FJ40Dash and replaced my OEM dash with the plastic cover which I had installed back in the 80s. My Cruiser is pretty close to stock and I show it (car shows) every so often so I wanted to retain the original look. Regardless, I decided to take a chance on the FJ40Dash over the OEM replacement. I've had it installed for a couple of months now and I can't say that I've ever noticed the trademark - it just doesn't jump out at you. I have noticed the quality look and feel of the dash and I'm delighted with my choice. I bought the dash and it is a million times better than OEM. I am VERY pleased and will add to the thread about my install soon. IMO you will not be unhappy with the product!!!!!!!!!!!! Super heavy duty dude. Ditto Flaa1a, I bought the dash for my 1969 and it is great. It is much better than the factory dash and I can live with the logo. A Picture of a Customers Rig "GA Architect" off of IH8mud.com showing both our upper and lower dash pads. Less expensive!!!! Cheapest OEM is approx. $400. Pricing on this site is less than what a Toyota Dealer can get an OEM dash for! Heck I've seen used beat up dashes go for over $400 on ebay. CHECK OUT VIDEO ABOVE AND COMPARE THAT TO AN OEM DASH!!! After Market Polyurethane Integral Skin Dash Pad fitting fj40s 9/72 through 10/82. This dash pad is made of very tough yet flexible foam. Integral skin means that it has a elastomer (Rubber like) skin with a soft inner core foam. UV inhibitors utilized in inmold coating, 20 gauge steel inserts (OEM only used 24 gauge). This same chemistry we have been utilizing and great success in heavy construction equipment OEM applications for years. I am having a little trouble with the online shipping calculator with regards to Canadian post codes, No dashes on the Code. SHIPPING: Domestically this will ship USPS. If you are in Canada contact me prior to purchase and I will ship USPS and let you know what the costs are. One Person Mesurement: I hope this makes sense because it's kind of hard to measure by yourself. Stretch a tape measure along the dash against the windshield. Start the tape to be perpendicular to the farthest verticle edge on driver's side (A little estimation here of where the two would intersect). Run the tape out to approximately the passenger seat and lock it to rest it on the dash. Go over to passenger side of vehicle. With your left hand secure the protruded measuring tape so it will not move, with your right hand unlock the tape and conitnue pulling it out to the farthest verticle edge on passenger side(Again estimation of where the two would intersect. Don't pull the tape down to the verticle edge but straight out.) Read measurement. If measurement is approximately 51.25" this dash will work. I have a customer going to fit it on a 69. It turns out well. It's a good idea to reference the "Dash Diagram" found on the Upper Dash Pad Retainer Clip page. There is a large metal clip that is welded to the dash, Part # 99 of diagram. It is actually called by many the "Dash Pad Support". You can see that this clip extends from the metal dash inwards toward the driver and passenger. Behind this metal clip (Actually in front of towards the engine compartment, blow up the picture and you can see) are slots that are needed for attachment of the dash pad. These slots are what the "L Clip" (#13 in the diagram) slides down into. This Dash Pad support actually goes up inside the dash pad. NOTE: If you have your old OEM dash pad clip (#13 in the diagram), DO NOT THROW IT AWAY with your old dash pad, or you will have to buy a used one or a reproduction one from us. You will also need part #13 the retainer dash ("L Clip"). This retainer clip screws into our dash pad and this slides down into the slots mentioned above behind the Dash Pad Support. The retainer dash clip is mounted to the dash pad by 9 screws. 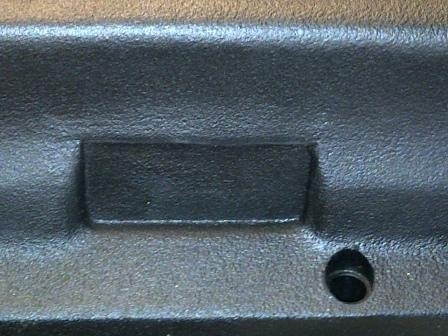 If you are attaching to a fj40dash.com upper dash, All 9 screw holes are present in the dash pad but 6 are encapsulated and cannot be seen. We give you 3 screw holes that are used for locating the clip, that being the one in the middle and on each end. Attach the screws in these three holes and all other six screw holes will line up. Sometimes it takes a little working the screw around to find the hole as it is filled with urethane. Get all 9 screws located in the holes before tightening them up. When mounting the retainer dash clip to the dash pad make sure that the retainer dash clip is such that the side of the clip is more inner towards the inside of the pad. If this is installed where the side of the “L” angled clip is towards the outer side of the dash pad there will be approximately a 5/8” gap between the dash pad and the lower windshield frame. On the Dash Pad Retainer Clip page there is a picture in the upper right hand area of the page. Click the picture and it will magnify so that you will get an idea of how it is mounted. Copyright © 2011-2019 FJ40Dash. All rights reserved.